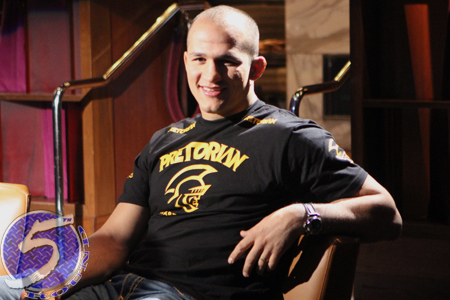 Former UFC heavyweight champion Junior dos Santos (pictured) is an honest guy, perhaps to a fault. When asked why he thought he was utterly destroyed by Cain Velasquez in December’s rematch, dos Santos provided the worst possible answer, then proceeded to give the second-to-worst response. With their trilogy just 48 hours away, and only 10 months removed from receiving the biggest beatdown of his career, dos Santos is admitting to not having a solution for the Velasquez that entered the Octagon the last time they fought. What’s going happen Saturday when that SAME Velasquez steps into the cage at UFC 166? That recipe provided the sweet taste of victory, so why wouldn’t Velasquez draw upon that exact same formula? When he does, that means dos Santos still won’t have a response for the assault he’s set to endure (again)? “I think we showed a little of ourselves in each fight,” dos Santos added. “In the first fight, I knocked him out, which is something I did a lot before. The second fight showed how he fights. Now we’ve learned more about each other and it’ll be great for the fans. Only 10 months have passed since getting mauled by Velasquez, and dos Santos has just posted a KO victory over Mark Hunt since that time. I’m not sure how much JDS could have learned or experienced between Velasquez fights, but I hope he’s got more up his sleeve than that. He only has two more days to cram. The final exam will be held Saturday at UFC 166.